Showing results for tags ' wiring'. Can anyone please tell me where i can get a good wiring diagram for my Kazuma Falcon 150 cc atv. I have tried numerous web sites looking. I have found some, but the picture was horrible couldn't even read it. Thanks, Craig. Hello everyone, I have a new to me 86 Bayou 300 that I just bought last night to get around the property. It wouldn't start when I bought it but it did turn over with starting fluid, PO said the carb neeeded cleaned. I cleaned the carb today but need to get the choke wired up as it was not wired up when purchased. I'm hoping one of you can help me get this choke wired up. Coming from the carb it has 2 wires. 1 is yellow and 1 is black. The PO said I needed to ground one and put the other one on a switch. Should I do it this way or is there another/better way to do it? I'd really appreciate any help I could get!! Thanks in advance! 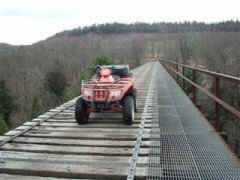 hey everyone I have a 1993 big bear 350 that I got an after market stator for it but there was no plug on the four main wires. I was wondering if anyone could tell me which wires go where on my bike. From the bike I have red, blue, yellow, and white/green, and from the stator I have green, brown, red, and white. If you can tell me thanks. I have a 2000 LT250 that I recently had to replace the key switch due to the loss of the original keys. Now I can see smoke coming from in front of the gas tank. I took the cover off from around the handlebars trying to see where it was coming from. I touched a small box that was so hot it actually burned my fingers. I disconnected the battery but I can't get to the box without taking off the rack and the front fender. My owners manual does not tell my what this is. It has 5 wires running to it (3 yellow, 1 brown & white and 1 red) it appears to be bolted to the frame in front of the gas tank just below the handlebars with 2 bolts. Can anyone help me with this? I added a couple of photos to show the item I"m talking about. Thanks in advance. does any one know the color of the wire going to the headlight/kill switch that supplys the power from the stator to the switch. I am wanting to get power from a switched 12v source. I got tired of looking for a diagram for this thing so I made one! If anyone else needs it, here it is. Hey guys, Just looking for a wiring diagram for the above.....just need to check wiring cos seem to not be getting spark. changed plug, and coil. Battery is also new. Does anyone have a electrical schematic for 1989 lt160f? Thanks in advance. slats_bigbear posted a topic in General Talk - Anything Goes! I just picked up a cheap big bear Im trying to fix up needs alot of work so going thru it piece by piece. 1. The air box is completely stripped no breather hose, no hose to carb, and no filter or pieces inisde. Can anyone tell me if the typical K&N air filter comes with everything I need... I know it was a oiled element stock that slid onto a sleeve which I dont have so Im trying to find the quickest easiet way to get it back together. 2. I bought a new ignition and plugged it in and it started hissing and getting hot at the plug connection, I ripped it out quick and checked with my meter and it still seems to be ok. So can anyone tell me if there brown wire the wire thats hot with ignition on has continuity to ground.... I traced mine all the way back to getting ground thru the neutral and reverse switches thru the relays and all. The only other thing I can figure is it seems when i pulled the ignition plug off the 2 prongs looked like they are pushed in too far as if they wouldt insert/engage into the female plugs on the opposite plug and maybe its jumping/arcing and shorting out. I do have a service manual, wiring diagrams, and found OEM parts diagrams I just cant make sense of these couple things with out a little direction. Any ideas??? Does anyone have or know of a place I can get a wiring diagram for a recently acquired Kazuma Falcon 110. Currently having to start crossing the soleniod. Electric start not functioning. No headlights no horn. Bought my son a used Kazuma Falcon 150. Has been running fine for 2 weeks since we bought. He uses it every day. Now it won't start. Visited these forums and started checking out electrical system getting familiar with all parts of circuit. First thing I notice different is our quad has 6 wires to Off-On-On key switch. 1 - red (typical) 1 - black (typical) 1 - green (typical) 1 - black\white (typical) 1 - yellow 1 - yellow white What do these other wires do? I also have determined (i believe) I have an automatic choke. I don't see this in any of the wiring diagrams I have found. I can't quite figure out the C.D.I yet. From what I seem to be reading is usually a significant issue on quads that don't start. Any suggestions? Any more detailed wiring diagrams out there which show additional wires to key switch and automatic choke? Need help with winch wiring. I bought the Grip Tools 3000 lb 12 Volt Electric ATV Winch 28770 from rural king the other day and put it on my polaris and it doesn't work I wired it up like the diagram in the instructions say and it doesn't do anything. The instructions go on and talk about some wires that need to be connected, but there is no extra wires to be hook up. 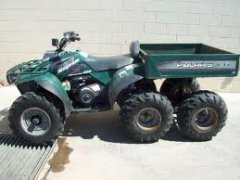 I purchased my first ATV last weekend, it is a Suzuki Eiger 4x4 Semi-Automatic. Along with this I also found a Swisher Plow, Dump Bucket, and Universal Mount for a good price. The final piece I bought was a Warn Winch (XT25). My question is: Does anyone have pictures of how they routed the wires from the winch to the contactor and then to the battery??? Of course you cannot run them anywhere that will come close to the hot engine or where moving parts may pinch the wires.